The Dartmouth College cross-country ski team will take a heartfelt and unusual afternoon workout today to remember a junior-class teammate, 20-year-old Torin Tucker. They will finish Torin’s final race. Former Sun Valley Ski Education Foundation Nordic skier Tucker collapsed and died Saturday, Feb. 1 while competing in the 33rd annual Craftsbury (Vt.) Marathon 50-kilometer (31-mile) race as a member of the Dartmouth Nordic team. Attempts to resuscitate Tucker at the scene were unsuccessful. According to a Feb. 5 Associated Press report, an autopsy determined Tucker died from a rare heart defect. The AP report went on to say that Tucker’s death certificate stated that he suffered sudden cardiac arrest as a result of a problem in the left coronary artery. Medical research says the condition is rare and is frequently associated with sudden death during intense physical activity, the report added. On the Dartmouth College ski team Web site was a description of how his teammates have decided to honor Tucker. It said, “To honor his incredible journey, we invite you to remember Torin alongside the rest of the Dartmouth Ski Team. The team will be meeting in the stadium area at Craftsbury Outdoor Center on Thursday, Feb. 6 at 4 p.m.
“We will ski out to the location on the Craftsbury Marathon course where Torin passed away, which will be marked by a cairn constructed by the Center. There will be a short ceremony where we will read a passage, and observe a moment of silence. “At this time, there will be two return options. Erik Fagerstrom (Class of 2014) will lead a group along the rest of the marathon course, finishing the 8 kilometers that Torin could not. The rest of the group will return to the stadium area via the most direct route. Of course, all are welcome to celebrate and remember Torin in the way they deem most fitting. The 2010 Community School graduate was the son of Scott Tucker of Boulder, Co. and southern California resident Kathryn Tucker. His survivors include a younger sister, Montana, currently studying in New Zealand, and aunt Susan Tucker who is married to his uncle Steve Meyers. Wednesday night, a memorial service for Tucker was held in Rollins Chapel on the campus of Dartmouth College in Hanover, N.H. The Dartmouth College flag flew at half-staff Monday and Tuesday to honor the memory of Tucker. The service included reflections from students and was followed by a candle-lighting ceremony on Baker Lawn and a gathering with a photo slideshow and refreshments in Collis Common Ground. Dean of the College Charlotte Johnson spoke at the service, which was attended by Tucker’s parents. Tucker was a member of the Chi Heorot fraternity at Dartmouth. His friends remembered his kind ways and sunny disposition. “Torin was a mountain boy from a mountain town. He came to Dartmouth with an inquisitive mind as a few Ski Team athletes can attest when Torin helped them sort through Physics formulas. At times his active and inquisitive mind would wrestle with life around him. I feel Torin lived a delicate balance between this overactive mind and the simple daily pleasures found in the mountains and on the trails. 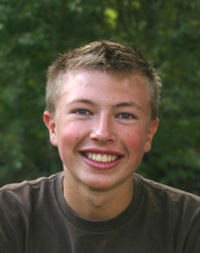 “Torin absolutely loved being a skier and a member of a ski team. His passion for both began in his mountain home in Sun Valley, Idaho and continued while at Dartmouth. I can think of very few who tried harder or wanted to be successful more than Torin. He had an immense will. “I know most skiers know what I’m talking about when remembering to what lengths Torin would go in pushing workouts and races. Torin was just knocking at the door these last few weeks in his quest for a carnival start—a feat not all that realistic even a year ago. Torin was woven into this very large skiing family. He was woven into his fraternity. He was woven into a number of academic families, some transitory, some more lasting. As with all families, the closer the ties the more complicated the relationships. With Torin it was even more so. Looking back, most are realizing the role Torin played in each of these groups. It’s going up to many of you to re-weave the gaping holes left behind. “My heart extends to Torin’s family. I hope you find some solace in knowing the impact Torin had on so many people here. Somewhere along the line someone asked, “Who was Torin’s best friend?” We all looked at each other blankly because the list would immediately grow larger than just one. It would grow realizing friendship was complicated by a balance of conflict and love. From there the list would grow geometrically. “I hope you can also find solace in knowing that his overactive mind appeared to find harmony while pursuing the mountain roots that meant so much to him. He was in full blossom at his passing. I’m sure Torin is tumbling around with his flashing smile in the snow outside.